Generation X is the first raised with, and on, video games. The evolution of games and gaming technology during my lifetime is quite remarkable. Everyone thinks of the original "Space Invaders" and blocky Atari graphics and how they've morphed and evolved into the near-photorealism of modern sports simulations and various military shooters. But it really all started with text adventures - both for me, and for the industry as a whole. I always liked playing board games. It was a true family activity. I remember my Dad spending free time when I was a kid doing all sorts of elaborate puzzles and games - map rallys, complex strategy games with tablecloth-sized paper maps and rulebooks as thick as novels, Go, and more. My father was one of the founders of a consulting company. One of the innovations they brought to the field was early adoption of computer systems for word processing, accounting, and more. Dad usually worked at least a half-day on Saturdays. My brother and I would frequently accompany him to his office. Being a kid fascinated with technology, I quickly discovered the green-screen Wang terminals...and then found the "Games" menu. Most of them were pretty lame, even by early 80s standards. You navigated by telling the game what you wanted to do: "Enter Building". "Look around". "Get lamp". It was fascinating - like being inside a book. Part of the challenge was solving puzzles. Part of the challenge was trying to figure out what commands would actually work. This was "Colossal Cave Adventure", and was apparently ported to the Wang mainframe by someone. Once I found that game, I couldn't wait to go to Dad's office on the weekend. I grew frustrated with my slow typing, and vowed one day I would learn to touch-type super-fast just so I could play these games. Not long after, our family purchased an Apple ][ computer, and managed to get a copy of "Zork" - a different take on Colossal Cave Adventure by a company called Infocom. My father, brother, and I would go on to play nearly every single one of Infocom's games. Infocom's games were perfect - fun, inventive, and daring. They made several sequels to Zork (for better or worse establishing the gaming industry tradition of multiple sequels and brand names). The packaging was sublime, both as a means of encouraging sales and discouraging piracy - some games required some of the pieces inside the box. Infocom started in the middle of 1979, and quickly expanded to write "text adventures" in nearly every literary genre. They made a murder mystery ("Deadline"), which came with "detective files". They made a science fiction game ("Starcross") that came in a 12" white plastic flying saucer. They made an "adult" sci-fi pulp game called "Leather Goddesses of Phobos". Perhaps best of all, they made a game called "Suspended" (one of the most inventive and challenging), whose box was a striking white face. Some games were hilarious comedies ("Planetfall", "Hitchhiker's Guide To The Galaxy"). Some were deadly serious. Some were mind-expanding. Most were some combination of the three. Nearly every one was a fantastic experience, challenging, fun, and occasionally emotionally touching. I played them for hours. I made maps. I walked around during the day trying to come up with puzzle solutions. I even tried programming a few games of my own. By 1989, it was over. Infocom closed. Rather than following a literary tradition of addressing the imagination directly, games have chosen the quick hit of ever-fancier graphics (they hit the limits of sonic realism about a decade ago). It's easy to be amazed by the near-photorealistic graphics of the latest shooter or sports simulation, but ultimately even stereoscopic 3D photorealism is lacking. There's no smell, for example. No texture. No temperature. No humidity. And because the graphics are so arresting, you seldom stop to think about or imagine these things. It's similar to the difference between books and movies. Books speak directly to your imagination, allowing you to fill in all kinds of detail, to draw upon your own memories and experiences, and synthesize. In film, pictures and sound do much of the work for you. This is great if you have some very specific things you're trying to express - things beyond words, or at least things beyond what words can easily achieve. Art leaves room for the audience, and I suppose that's part of the power of the written word. I've played a lot of visually striking games, some quite beautiful. I have had dreams where I wander the virtual spaces I've explored in them. 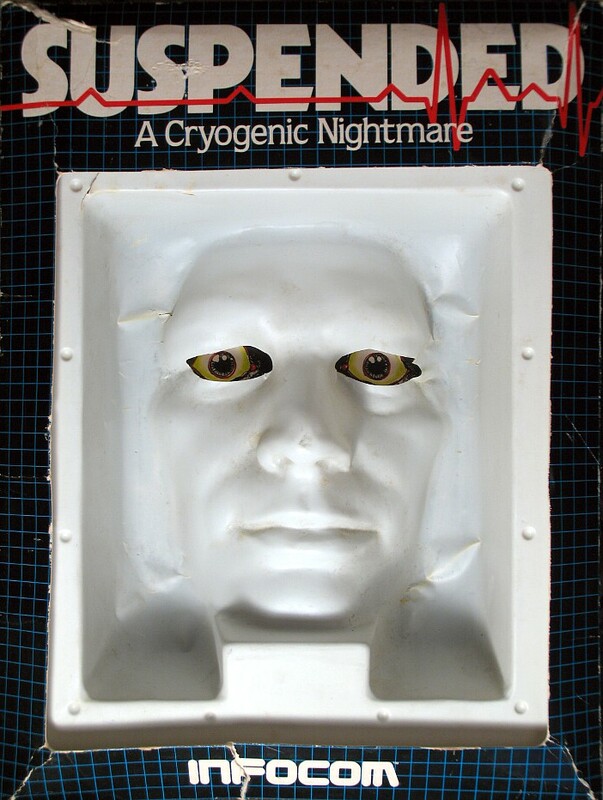 But I've never had a graphically pretty game make me cry the way I did near the end of one of the best Infocom games. "We didn't spend enough time thinking about how lucky we were...we kind of assumed 'Oh this is what it will always be like...this is going to go on forever'. Much like youth itself..."
All that said, I also find it incredibly difficult to go back to these games now, simply because they are so slow, and require such a controlled and deliberate play style. They're not immediately satisfying, and in some ways, they're not even "fun". Many of them give you the same brain itch the Sunday crossword in the New York Times does. But like many other childhood experiences perhaps best remembered than revisited, I think of them and their impact often. 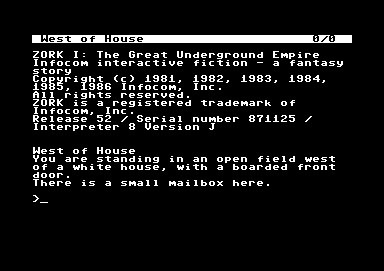 You can play Zork (and many other Infocom games) online for free, or find apps for your smartphone. I am awake. It is dark. Rolling over, I feel my vertebrae clicking and shifting. I lie still for a few moments, checking to see if I'm going to fall back asleep quickly. I rise from bed carefully. I can't remember the layout of the room or if I left anything on the floor. I shuffle carefully to the bathroom and get a glass of water. Clock says 5:00 am. I get back in bed and start doing time math, budgeting for some exercise, shower, breakfast, walk time...I should really just get up now. I'm awake anyhow. I load a cartridge into the espresso gun and wait for it to calibrate. Yesterday - Saturday, or Sunday, depending on your perspective - I was home. I walked on the beach with my wife, the cold air scouring our faces with sand as the waves came and went. I returned to SFO for my 3rd round trip in 3 days and sat on a plane for 11 hours to arrive here: London. I didn't sleep much on the plane. Too hot. Too cold. Too many people snoring. Too much on my mind. Unable to get comfortable. The taxi ride was unpleasant, between the greenhouse conditions in the back seat and fatigue, I attained a near-transcendent state of nausea. Then the cabbie dropped us off at the wrong place with the wrong directions. But I did what anyone else would do after 11+ hours of travel: I worked out. The hotel gym was blissfully deserted, and their treadmill had some crazy graphics showing virtual mountains, islands, and tracks. My feet go thump thump thump thump over the whine of the belt. I run my first 5K in under 29 minutes, starting cold and including a 5 minute warm-up. Then I run another 65 minutes at 80% of my maximum heart rate, before dropping into a 5 minute cool-down. My shirt is drenched. My face is red. I don't know it at the time, but I am chapped in several sensitive areas. It's been at least a week since I was able to put in a good long cardio session. I think the last time was Tokyo, which was, what, last week? But after the Tokyo flight I was too tired to go this long and this hard. It feels good. And it feels awful. Los Angeles was 48 hours ago. Tokyo was 72. It is April now. Mid-April. Sunday. I cool down, sweat still pouring from my face and chest. Shower, clean clothes. My colleague and I head out into the beautiful London night. There's a restaurant nearby up on the 32nd floor of a building. The view of London as the sun sets is spectacular, and the food is delicious. I get all the way to the end before the jet lag fog starts creeping in. My voice gets creaky. Back at the hotel we have a drink in the deserted and beautiful lounge and talk about our life, such as it is these days. Scrambled time to go with scrambled eggs. Coffee and whiskey. Sit for a long time, run for a long time. I think of the flooded streets of London described in Ballard's "The Drowned World". Piano music. A knock at the door. Room service. The day calls.